The regular season in college football has given way to all the conference championship matchups that are on this week’s slate. While the betting public will be fixated on the major conferences such as the SEC, Big Ten and Pac-12, I will continue to focus my attention on the top teams in the mid-majors. Even these championship games tend to stay well “under the radar,” which can add a tremendous amount of value to the current line if you know where and how to look. Last week’s selections took a back slide to 1-2 to leave me at an even 19-19-1 for the regular season. Fortunately, the postseason is my time to shine, as while the pile of diamonds in the rough becomes noticeable smaller, the hidden gems actually become easier to find. The following are my three top college football picks for this week’s mid-major matchups with lines provided by 5Dimes. 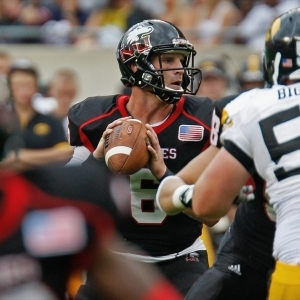 Northern Illinois claimed the top spot in the Mid-American’s West Division with a perfect 8-0 straight-up record in conference play. The Huskies went 11-1 SU and 9-2-1 against the spread. They are ranked ninth in the nation in rushing with an average of 245 yards a game and their defense is holding teams to 17.5 points a game. Flipping over to the MAC’s East Division champion, it is almost a mirror image. Kent State is also 8-0 SU in conference play and 11-1 SU (10-2 ATS) overall. The Golden Flashes also boast a dominating ground game that is churning out 241.5 yards a game. Their defense has not been as tight in giving up 23.5 points a game, but the offense has more than compensated for this with an average of 34.4 points a game. While the Huskies have dominated this series in the recent past with a 5-0 record both SU and ATS in the last five meetings, the difference in talent this season between the two is almost negligible. The fact that this championship game is being played at a neutral site shifts the edge just enough in Kent State’s favor with the five points. Central Florida will be making its second trip to Tulsa in 10 days after losing to the Golden Hurricane 23-21 in the regular season as a one-point road underdog. It was the Knights only loss this season in Conference USA play, and they went 9-3 SU (6-6 ATS) overall. Tulsa is coming off a stunning 35-27 loss to SMU as a 5.5-point road favorite in its only conference loss this year. It went 7-1 SU to win the C-USA West and 9-3 SU (6-5 ATS) overall. By virtue of the earlier win, it earned the right to host this conference championship game. The first time these two teams met, the Golden Hurricane outgained UCF 461 to 235 in total yards and had over a 3-to-1 edge in yards on the ground. On paper the game was not nearly as close as the final score, but a couple of Tulsa turnovers helped the Knights keep it that way. The home team is 4-1 ATS in the last five meetings further swinging the edge in the Golden Hurricane’s favor. Middle Tennessee rolled through its Sun Belt schedule with a 6-1 record and went 8-3 SU (7-3-1 ATS) overall. While the Blue Raiders have shown solid balance on offense between running and passing the ball, their defense has been somewhat of a liability. It has given up an average of 26.5 points a game. Arkansas State pretty much duplicated the numbers above at 6-1 SU in conference play and 8-3 SU (7-4 ATS). After a late September loss to Western Kentucky, the Red Wolves have won their last six games in which they averaged 40.5 points while outscoring their opponents by over two touchdowns. This series has remained tight over the past five seasons with Arkansas State holding a 3-2 edge SU and Middle Tennessee having a 3-2 edge ATS. The big advantage in this matchup has gone to the home team with a 4-1 record ATS in the last five meetings. When you add in the fact that the Red Wolves come in as the more complete team on both sides of the ball, do not worry about laying the 9.5 points at home in this year’s game.